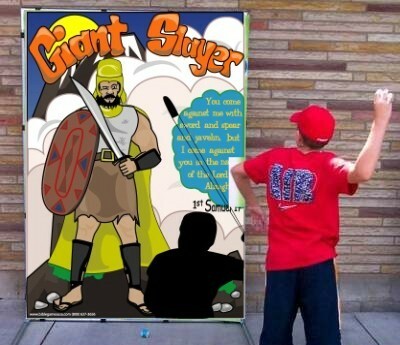 Kids will learn the story of David & Goliath in Giant Slayer. Using soft hacky-sack balls, children try to knock down Goliath by getting the ball through the hole in his forehead! At 7' X 5', Giant Slayer is smaller than the traditional frame-game, making it much more convenient. It can go just about anywhere, Plus, transportation and storage is a snap. Size: Height: 7ft. Width: 5ft. Depth: 3ft.